although a series of destruction which was carried by Portuguese in 1662 did not led the downfall of this temple instead it impelled Dutch to reconstruct this chronological synagogue two years later after its denudation. Being one of the 7 synagogues of Cochin Jewish community within the empire of Cochin this cathedral is commonly referred as Paradesi Synagogue and behind this name it connects the history of Jews. As the meaning of Paradesi relates to foreigners and apparently it was built by Jews who were actually alien for the Cochin People so that’s how the name Paradesi came in to be. Mattancherry of Jewish synagogue is silently situated within the section of Old Cochin which is known as Jew town and the thing to note is it is only one out of seven which is still used by people. Built at the sites of Mattancherry palace temple this synagogue can be considered as testimonies of Jews in the land of Cochin. The Malabar Jews who came here and developed healthy relation with the Raja of Kochi were expert in trading and that’s how they gained controlled of Major area of worldwide spice trade. 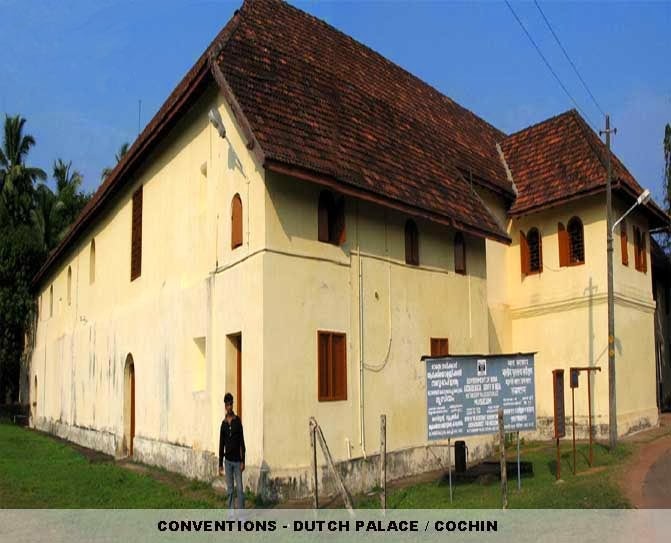 As per the folklore the land to build the synagogue was presented by Raja of Kochi and it has also been put into the context that the original synagogue paved its way in 4th century when the Jew traders played their mercantile role within the coast of Malabar. The moment you enter into Synagogue the huge hall will take your breath away beside that their exclusive compilation of antiques adds more delight to the sight. Glowing light that sneaks from the veil of window reflects the charm of the chandeliers and lamps. Stunning chandeliers sagging from the ceiling reflects the glory of the 19th century. Mesmerizing floor is a masterpiece of all which is painted manually in blue willow pattern. Dazzling ceramic tiles which were brought from Canton reveals the glorious construction of the Synagogue. Significant feature of this tiles are each differs from each other and the splendid pillars reflects the time of their life. Brass rails which is built at the heart of the room calls for marvellous feature and make sure to allure unique gallery and carved teak ark. A copper plate with an inscription which dates its history back to 4th century portrays the wisdom of the erstwhile Cochin king. While you make your way here to this historical site of Cochin make sure to check out some of the amazing compilation which they have in their shore such as hand painted tiles, Belgian glass chandeliers, brass-railed pulpit, hand-knotted oriental rug, A tablet from the 1344 synagogue in Kochangadi, 18th century canton which was brought from China, clock tower, great scrolls of the Old Testament, copper plates and many more. Being a historical site and only operating synagogue where both men and women have separate sitting arrangement calls for a number of tourist throughout the year. As its amazing art fare that reflects their time, wisdom and building aptitude is thoroughly enjoyed and excavated by historians and traveller. Nearest railway station is Ernakulam and it is about 10 km away from the Synagogue. Nearest airport is Cochin International Airport and it is about 30 km from the Synagogue.